Street art constitutes the vast majority of what hangs on the actual walls of the museum without walls. Given the broad institutional boundaries and lack of restraints, it remains a wonder that there remains such a limited repertoire of subject and style. Graffiti doesn’t constantly surprise you any more than an art gallery does. With street art, though, that normally redundant practice, taking two-dimensional photographs of flat objects, is an important part of the game. Having abandoned your (anonymous) work to the vagaries of weather and municipal buffers, you can revel in its genuine ephemerality, but photography is evidence – published books of street art are documentation, not reproduction. And for the photographer, capturing a choice piece of work is not only part of exploring a new or familiar environment, but also of entering into a potential relationship with the artist. Publishing a photograph of something you found pretty and being told, after the fact, ‘that’s by Bobbyphonics’. Less so in the gallery, where we already know what everything is, and are likely to take a picture of the label after the work, just so we get the metadata correct. But even in a gallery the visitor-photographer is more than a weak echo of the official installation photographer. Taking pictures in a gallery is performative: it records your own visit; it’s interpretive: photographs of objects from new angles and in new lights show new truths; and it’s also (without over-egging the ‘media’ part of that particular pudding) social: we can share photos of artworks we’ve seen as meaningfully as photos of people we’ve met. At the Kinetica Art Fair, the third eye culture was in full effect. It was hard to walk from one stand to another without getting between an artwork and someone’s camera. The hectic atmosphere feels like a challenge to capture rather than regard, to take something away and create your own something out of it. Still, the nature of kinetic works seemed to provide a rare justification for cameras that record moving image, and for Flickr’s display of same. But Kinetica is, after all, an art fair, somewhere transient, to shout and trade. In established museums and art galleries, official photography policies are moving more slowly. Object museums like the V&A lead the way because there are few ‘rights’ issues with historical and antique forms (unless they are particularly uncomfortable), but even contemporary art galleries are moving away from blanket ‘no photography’ policies. But there are some unresolved issue about taking and using the photos. In Birmingham and Walsall this weekend, being allowed to take photographs meant: 1) signing a piece of paper saying that any photographs you took would be for ‘personal use’ only. 2) Being given a sticker with a picture of a camera on it to let gallery invigilators know you had signed said piece of paper. 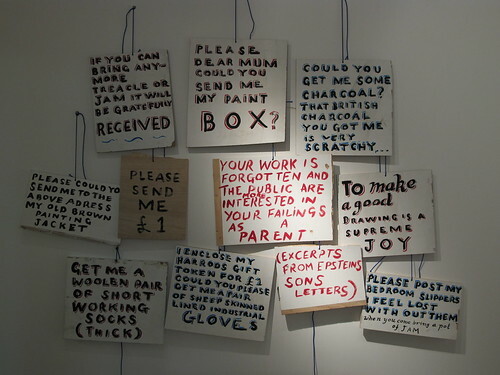 Even so, there were still some exceptions: the main floor of the Bob and Roberta Smith-curated ‘Inner Life of the Mind’ exhibition was strictly off limits because it contained ‘works from the Tate’ according to the main desk. The restrictions on use suggest that the galleries understand that taking photographs can be an important part of visiting an art gallery; but that they’re still a little uncomfortable with the use of the actual photographs themselves (perhaps because the reproduction of artworks is embedded in a artworld system larger than small galleries; but also because digital photography has fundamentally changed the nature of photographs). Personally, I’m dubious about the validity of a contract I’ve signed but haven’t been given a copy of; and consider posting images on Flickr well within the bounds of ‘personal’ use. We should move on from considering Tate Online as ‘Tate’s fifth gallery’ to making online, quite simply, a dimension of practically everything Tate does, from research and conservation to fundraising and public programmes. A single user login will be built across all systems so that users can administer all their site preferences (collection perspectives, email bulletin settings, online course progress, My Collection, ecommerce logins, membership, patrons, shop, comments, forums etc.) and push notifications to email and social media in a single place. The online collection will be moved back to the heart of the website making it the hub around which much of the website radiates. The site will integrate with existing social networks (Facebook, Flickr, YouTube etc.) and partner them on specific projects rather than trying to create a competing social networking website. Each research centre and major project will be provided with a project blog to update their specialist audiences on developments and findings and to invite contributions from third parties. The blog will exist for the period of each project and then be mothballed as a record of the project. Unmediated interaction with online audiences will be new to almost everyone involved and therefore training, new policies and new skills will need to be developed to help Tate staff shape communities. Key to our approach must be a recognition that social media websites are not just a new platform to advertise our activities or promote our brand. We must transparently interact with audiences and, though this is labour intensive, the result will be an engaged audience with whom we have a deep relationship. Consumption of online content has shifted towards users as authors and editors, especially through social media and online publishing platforms (blogs, YouTube, Flickr, etc.). We shall embrace audience creativity and personal ambitions, though new end user licences, empowering them to reuse and remix Tate content. Most of the content on Tate Online is published under restrictive end-user licences. We shall audit these and review what content could be released under a more permissive licence that would enable users to reuse and remix this content as part of their own creative projects or research. User-generated content will be pervasive throughout the website in the form of user comments, discussion threads, crowdsourcing of data and creative online communities, including Tate Kids, Young Tate and Creative Spaces. One of the challenges this raises is how to communicate the authority of Tate’s research and scholarship amongst a myriad of voices and opinions. However, we see this as a problem that can be resolved with design rather than with architecture, and thus user voices and Tate voices will be intermixed. The web will continue to evolve rapidly and Tate must be in a position to take advantage of these changes and move with the times. It is therefore critical that a scalable technical and information architecture is developed that will allow the website to grow and change quickly.